Living Room with seasonal fireplace. Free Adult Ticket to Hatfield & McCoy Dinner Show with our Explorie Package for staying with us. Whispering Pines Condo WP531 is a spacious condo unit with 3 bedrooms and 3 full bathrooms. Each bedroom boasts a king bed, a flat screen TV, as well as a ceiling fan for full comfort! There is a Jacuzzi tub in the master bedroom! We know your family will make many memories as they relax around the flat screen TV/DVD and seasonal gas fireplace in the comfortable living room, or work together to make that delicious family meal in the completely furnished kitchen. Of course there is complimentary Wi-Fi so everyone may check email or play games and music! There is plenty of space to dine on the extra-large private balcony, too. We provided a rocker on the balcony for those quiet morning moments with your steaming cup of coffee, made complete by the commanding wooded views of the Great Smoky Mountains and Pigeon Forge. Other unit amenities include a washer and dryer. Although it rained most of our stay, it was great to just get away. Thank you so much for staying with us at Whispering Pines! We're glad you were able to enjoy a well deserved getaway to Pigeon Forge. We are sorry to hear that it rained most of the time, but we're happy that you were still able to have a fun trip. We hope you'll stay with us again the next time you're in town! We have stayed at Whispering Pines every year for several years in a row. Great place to stay, always clean and well kept. Staff is very friendly and helpful. Would recommend to anyone. Thank you! We try to be a place where families can come time and time again. So happy to hear you all enjoyed another trip with us and than you for recommending us! We look forward to seeing you the next time you are in the area! We stayed for only 2 nights and wished we could have stayed longer. Our 2 yo grand didn't want to leave and was very vocal about it. We all would love to return to the same condo as this one was sooo clean and comfortable. The bedwas hard to leave each morning. We will be back in the summer and let the grands enjoy the lazy river. Can't wait! We love hearing responses like this! There is truly nothing like making memories with your loved ones while on vacation. So happy to hear you all and especially your 2 year old grandchild enjoyed Whispering Pines. Thank you for your kind comments regarding the cleanliness and such. We certainly appreciate you and look forward to having you all back! Extremely clean, beautiful , very spacious!! Check in was very welcoming as we were PCB evacuees, we were a little grumpy. They were so nice to us!! We are sorry that you were forced to leave PCB, but we are happy that you found us and had a good time at Whispering Pines Condos in Pigeon Forge. We appreciate your excellent review and comments and hope you will visit us again at a time of your choosing. Stay safe. Great place. Very enjoyable.loved the rental. Thank you Roy! We appreciate your review and are so pleased to know that you enjoyed condo 531. We hope that you are able to visit us again soon. Literally nothing to complain about this place. A beautiful Mountain View and the condo was everything that was described in the description online. All around great experience. Thank you so much for staying with us at Whispering Pines in unit 531! We agree, that is an amazing mountain view condo and we're absolutely thrilled to hear that you all enjoyed it so much. We hope you'll stay with us again the next time you're visiting beautiful Pigeon Forge! Thank you for your visit; glad you enjoyed the pool. We appreciate your review and comments. Hope you will stay with us again. If you visit during the cooler months, you can enjoy of indoor pool facilities. Your Review and Comments are awesome. We appreciate your staying with us at your home-away-from home. We apologize for the tight squeeze while preparing meals. We are glad that you enjoyed the super clean unit and our super friendly staff. We look forward to your return. A great place to stay on your family vacation. Whispering Pines is the best place to stay in Pigeon Forge. Our condo upon arrival was clean and well-maintained. It was a beautiful condo that meet all our needs in terms of rooms, bathrooms and kitchen. There was also plenty of activities with an outdoor and indoor pool. Plus, the condos are right near the parkway where there are lots of restaurants, arcades, museums, and other activities for you to do. Not to mention it’s only a quick drive to Dollywood where our family spent most of our time. I would highly recommend this to anyone wanting to stay here. We have stayed here multiple times and it’s the best place for our family based on price, location, and other amentities. Thank you so much for staying with us at Whispering Pines! We cannot express into words our appreciation of you and your loyal business. You and your family are the reason why we love what we do and are what we are here for. A title like "the best place to stay in Pigeon Forge" is one we take very seriously and hold in the highest regard! We truly thank you for your kind words about our condos, property, and experience vacationing with us! We welcome you back very soon; we certainly look forward to it! We really enjoyed the condo, fanatic views and amenities! Thank you so much for staying with us at Whispering Pines! We're so glad to hear that you enjoyed the condo and took advantage of all the amenities that our property has to offer. There's nothing better than sitting out on your balcony and seeing those beautiful mountain views. We hope that you come to see us again soon! We loved our condo at Whispering Pines! The room was great, the location was perfect. We will definitely book here again! Great! So glad you all enjoyed Spring Break With us! Thank you for staying with us! We hope you all can come back and see us again soon! My friends and I love staying at the Whispering Pines Condos for our Ladies' Getaway because the rooms are spacious and we have everything we need when we stay there. The only disappointment is the TV cabinet had doors that did not go in the cabinet and if were not sitting in front of the TV then we couldn't see the TV because the doors of the cabinet blocked the view. Also the hairdryers in the first two bedrooms didn't work but thankfully 2 of my friends brought their hairdryers. Overall these are small issues and did not hinder our trip. We will definitely return to Whispering Pines again. The management team is super nice and was very helpful. Thank you for spending your Ladies' Getaway with us at Whispering Pines Resort. We will contact the condo owner in regards to the tv cabinet issue that you describe, we will do our best to resolve this issue. Please let us know if you have an issue during your stay, we have an onsite maintenance department that can check items like the hair dryers. We will look into this promptly. Your kind comments regarding our management team is very appreciated. We cant wait to see you during your next visit. Everything is so clean and the staff was nice and helpful. We could park our car and walk to the shuttle, helps not to have to fight the traffic. Thank you so much for staying with us at Whispering Pines Resort. We appreciate your kind words regarding our staff and our resort. We welcome you back to stay with us again when visiting the Pigeon Forge area. We enjoyed our stay but there was a lot of noise ( like a thumping or knocking inside the walls). Maybe this was because it was on the end of the building ? I would love to come back but would prefer a condo midway, closer to the elevator and hardwood floors. We especially liked the free movies each evening. Thank you for staying with us at Whispering Pines Resort. We are happy to hear that you enjoyed your stay. Please always let us know if you have an issue during your stay, we are always here to make sure that you have the best experience possible when visiting us. We will be glad to help you find the perfect condo for your next getaway. We are glad that our Free DVD rental center was something you enjoyed. We appreciate you and your feedback. We look forward to seeing you again soon. Loved our stay at whispering lives as always. Thank you for coming to see us and we are glad you enjoyed your stay! Come back again anytime! We are so glad to hear that you enjoyed condo 531 and the amazing view from the balcony. We appreciate you and look forward to seeing you in the new year. AWESOME as always. Whispering pines is a GREAT place to stay. Great! Thank you for being a repeat guest at Whispering Pines. We appreciate your "Awesome" review and so glad that you had another great experience while staying with us. We look forward to seeing you again soon! Just like alway the accommodations was great ! Thank you for staying with us! Looking forward to seeing you again! VERY NICE PLACE TO STAY. CLEAN AND COZY. ONLY COMPLAINT WAS TV REMOTES DID NOT WORK PROPERLY. Thank you for staying with us at Whispering Pines Resort. We are glad that you found condo 531 clean and cozy for your stay. We are terribly sorry you had an issue with your remotes, please always let us know so we can address the issue while on site with us. Thank you for your feedback and we hope to see you again while visiting the Pigeon Forge area. Thank you for your excellent review and visit to Whispering Pines Condos in Pigeon Forge, TN. We are glad that you had a wonderful vacation and will return. It was amazing, just too short!!!! Vacations are always too short! Thank you for staying with us and we are so happy to hear you all had a great time with us. Hope you made many memories! We hope to see you again soon. We are so glad you enjoyed your stay with us! We hope you are able to make it back to Pigeon Forge and Whispering Pines soon. We loved staying at this condo! It felt like home and a vacation, all at the same time! We loved having you as our guest at Whispering Pines and are so happy that you felt right at home during your stay. Thank you for staying with us and we hope that you can visit us again. Whispering Pines is so convenient to Pigeon forge. The condos are always very clean. This particular condo had a couple of things that need attention. The front 2 bedrooms have practically no lighting. No ceiling lighting & only one lamp in room. The master bedroom had adequate lighting. We would still stay with Whispering Pines because of cleanliness, staff & complex, and the lighting could easily be remedied. A great place to stay. Thank you so much for staying! We will address your concerns with owner and get more lighting for this unit! We look forward to you staying with us again! Thank you for your excellent review of Whispering Pines Condos in Pigeon Forge, TN. We are blessed to have a wonderful Housekeeping Staff. Everything was very clean and comfortable. The staff was very friendly and helpful. It was pretty easy to find and was close to the parkway yet far enough away you didn't hear the traffic. We were all very pleased with our stay. We are glad that you were pleased with your stay in unit 531 at Whispering Pines Condos in Pigeon Forge, TN. Please, come again. We always have a great time in these condos. Very little noise and everyone is so friendly and helpful. Thank you for your feedback. We are so pleased to hear you continue to enjoy your stay with us at Whispering Pines. We appreciate you and look forward to your next visit. I absolutely love the facility , the pools are wonderful for the small kids and we loved the hot tubs, my only complaint was the living room furniture was awful, it was stained and very uncomfortable, and the couch that let out into a bed was awful also, not suitable for anyone to sleep on. The owner of that specific condo really needs to consider replacing the furniture. I will definitely be staying at whispering pines again just not in unit 531. We loved the bedroom furniture very well decorated , linens were really nice, plenty of extra lines also . Thank you for your feedback! We are pleased to hear you enjoyed all of what Whispering Pines has to offer. We will be sure to let the homeowner know about the furniture concerns, we will also have our maintenance department check out the sleeper sofa. We appreciate your patronage and look forward to your next visit! Thank youfor your review and we are so glad we made you happy! We appreciate all of our guests and hope to see you again soon! We love staying at Whispering Pines - the location is convenient, the staff friendly and the units very clean. We are pleased to hear you continue to enjoy your stay at Whispering Pines! Thank you for staying with us and we look forward to your next visit. The Condo Unit(WP531) was AWESOME!! Really no bad complaints...The love seat & sofa were not very comfortable and could stand to be replaced, the plumping noise was a little loud in one of the bath rooms, but none of those things keep us from enjoying our stay at Whispering Pines we will be going back on our next PF Vacation!!!! I am so sorry about that noise from the bathroom. I will be sure to pass that along to our maintenance staff. I will also let the owner of that unit know about your suggestion about the furniture. I am glad you enjoyed your stay though and we most certainly look forward to your next Pigeon Forge vacation as well! Thank You! over all very pleased with the unit. Clean, placemats and napkins need replacing. More lighting needed in small bedrooms by fans with light kit. complex is in a good location and office staff very helpful. Thank you for your feedback! We are pleased to hear you enjoyed your stay with us at Whispering Pines. We will be sure to pass along your suggestions to the homeowners and management. We appreciate you and look forward to your next stay. A group of girl friends and I recently stayed @ Whispering Pines for a long weekend. We were so impressed with the beautiful condo! It was clean and nicely furnished. We especially loved the spacious balcony. It was perfect for enjoying morning coffee. 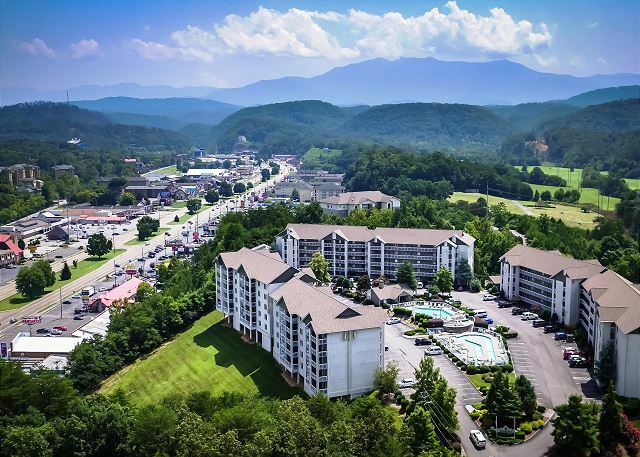 The location of the condo was perfect - centrally located in heart of Pigeon Forge. All my friends plan to come back and bring their families next time. We are so pleased to hear you enjoyed a fun girls weekend with us at Whispering Pines! We appreciate your patronage and look forward to future visits! Very pleasant, clean, staff helpful, repaired lock in in timely manner, restaurant recommendation excellent, deck also clean,which was important to us.Will stay again. We are so happy you enjoyed your stay with us and found everything to be satisfactory upon arrival! We appreciate you so much and hope you return soon! A wonderful place to stay with family. This is a wonderful place to stay. We have stayed here for many years and just love it. The office staff is very nice to deal with. Lots of restaurants to choose from. I would recommend this place to anyone. Very clean and lots of room to just relax and have fun. Vicki ~ Thank you so much for being a loyal repeat guest. We appreciate you and your kinds words regarding the staff and for recommending us to others. We are so happy to know that you love staying her as much as we love having you. We hope to see you again soon. Thank you for taking the time to tell us about your stay! We hope to see you in the future! We look forward to your next stay with us, thank you!